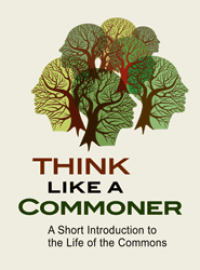 Every few weeks, I seem to give extended radio and pocast interviews about the commons, and write occasional talks and essays that find their way to the Web. Here is a quick round-up of some of my more notable recent media appearances. 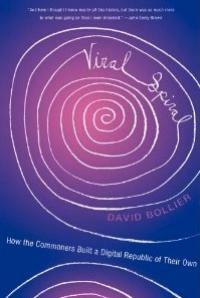 Writer’s Voice on Patterns of Commoning. One of my favorite interviewers is the skilled and sophisticated Francesca Rheannon of the syndicated radio show Writer’s Voice. 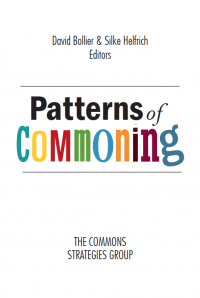 In early August, she aired our half-hour conversation about Patterns of Commoning, the book that I co-edited with Silke Helfrich that profiles dozens of successful commons around the world. Progressive philanthropy and system change. 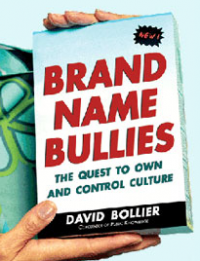 In June, I had an extended interview with Steve Boland, host of the podcast Next in Nonprofits. We talked about progressive philanthropy and system change, a dialogue prompted by my April essay prepared for EDGE Funders Alliance on this same topic. The importance of public squares. The Hartford, Connecticut, public radio show, The Colin McEnroe Show, featured me and two other guests talking about “Democracy in the Public Square," on April 28, 2016. I focused on the tension between the government as the lawful guardian of public spaces, and the moral authority and human rights of the people to congregate in public spaces. Le Temps des Communes, surely the largest festival of the commons ever, is about to get underway! The festival is not just a single event in a single place, but a series of more than 250 self-organized events to be held over the course of fifteen days in France, Belgium, Switzerland, Canada (Quebec) and several Francophone countries in west Africa. From October 5 to 18, there will be symposia, workshops, lectures and participatory events on all sorts of commons-related topics. There will be events to showcase free and open source software, community gardens, participatory mapping projects, seed-sharing, open scientific knowledge, renewable energy co-operatives, land trusts and even a Creative Commons-licensed musical. The hundreds of festival events will help introduce the commons to the general public and demonstrate to current commoners just how large, diverse and exciting the world of collaborative provisioning truly is. In Lyon, there will be a roundtable about making the city a commons. In Brussels, there will be an Open Source Festival. In Brest, a bike tour of shared gardens. In Paris, nearly thirty different events are planned. I wish that I could attend the “law and the commons” discussion that will feature Stefano Rodotà, the Italian law scholar, politician and human rights advocate who has pioneered new legal principles for the commons. Paris will also host “A Day in the Commons” on Île-de-France, with workshop, a meal and planning for the future. How will agriculture have to change if we are going to successfully navigate past Peak Oil and address climate change? A new film documentary, Voices of Transition, provides plenty of answers from Transition-oriented farmers in France, Great Britain and Cuba. Produced and directed by French/German filmmaker Nils Aguilar, the 65-minute film is “a completely independent, participative film project” that both critiques the problems of globalized industrial agriculture and showcases localized, eco-friendly alternatives. The film features actual farmers showing us their farms and describing the human-scale, eco-friendly, community-based alternatives that they are developing. You can watch a trailer of the movie in English, German and French here and read a synopsis here. Go to the film’s website to check out the public screenings and DVD versions that you can buy. Here is a link to the campaign around the international launch of the film. Once processing and transport are taken into account, industrial agriculture is responsible for around 40% of greenhouse gas emissions, the film explains. To produce on single calorie of food, ten to twenty times that amount of energy are needed. Almost all government subsidies and R&D budgets are focused on this unsustainable agricultural model – and worse, most of these subsides go to the biggest, most polluting farms. The results: Heavy chemical use literally kills valuable organisms in the soil, causing a cascade of ecological disruptions. The use of monoculture crops over vast areas of land means that wildlife and biodiversity are declining. And the centralized distribution of food makes the entire system highly vulnerable to the costs of oil and potential disruptions of supply. If trucks were to stop arriving at supermarkets, they would empty within three days. A French farmer is reintroducing soil-enriching plants in fields, and even trees in fields, because a tree's leaves and roots enrich the soil with organic matter and aerate the soil, allowing living organisms to breathe.” This kind of “ecological agronomy” helps maintain soil fertility and prevent soil depletion. For those of you who read French, a terrific new collection of 30 essays about the commons of knowledge has just been published. Libres Savoirs: les biens communs de la connaissance, edited by the French organization Vecam, features essays from authors around the world writing about the knowledge commons. 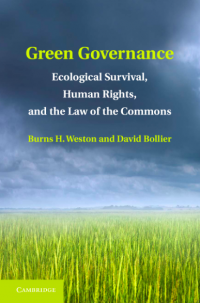 The pieces focus on educational resources, open source software, open access publishing, the patenting of seeds, health, the commons as a movement, and many other topics. Among the a uthors: Charlotte Hess, Prabir Purkayastha & Amit Sengupta, Jean-Claude Guédon, Philippe Aigrain, Peter Linebaugh, Michel Bauwens, Leslie Chan, Subbiah Arunachalam & Barbara Kirsop, Gaëlle Krikorian, Madhavi Sunder & Anupam Chander, Xuan Li, Claire Brossaud…and many others. Libres Savoirs is the first such book on the subject published in France, and is available at the online bookstore of C&F editions. 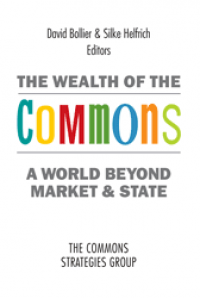 The organization that edited the book and provided French translations, as needed, is Vecam, a group dedicated to helping citizens understand the economic and political implications of the new knowledge commons. A hearty salute to Valérie Peugeot, Frédéric Sultan, Hervé Le Crosnier and Nicolas Taffin for their role in pulling this volume together! It is likely to spread awareness of the commons in France. Read more about Welcome Libres Savoirs! Read more about "The Gleaners and I"